Here’s what’s up in the world of TV for Wednesday, September 28. All times are Eastern. You’re The Worst (FXX, 10 p.m.): In “Twenty-Two,” written and directed by Worst showrunner Stephen Falk, “Edgar spends the day trying to find some relief for his PTSD.” Based on Aya Cash and Kether Donohue’s recent virgin appearance on Comedy Bang! Bang! the podcast, this is going to be one helluva episode. We have no problem believing reviewer Vikram Murthi can handle the weight of this episode, but we are pretty worried about how Edgar is going to handle it all. 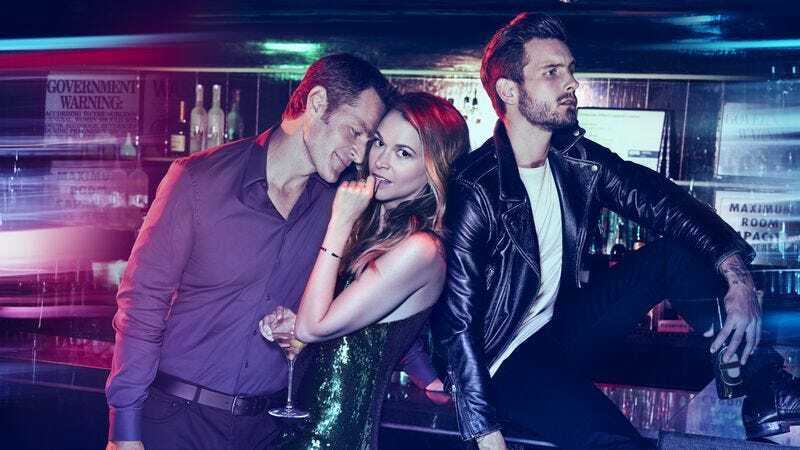 Younger/Impastor (TV Land, 10/10:30 p.m.): TV Land is taking a break from Golden Girls reruns—and really, you will find no judgment here when it comes to GG—to air a couple of its original series offerings. Both of these returning TV Land shows are all about frauds who just don’t know how to say no to a con; kind of makes you miss how straightforward and honest Jim Gaffigan was about himself, now doesn’t it? Anyway, back to the con artists. In the Younger season three premiere, “Liza sends Caitlin off to college and weighs her feelings for Josh and Charles.” First of all: Phew. Let’s get that whole daughter anchor out of here! Second of all: Never forget Younger named its two interests… Josh (and) Charles. Pour one out for The Good Wife, etc. Then, in Impastor’s second season premiere, “Buddy tries to outwit detectives, but his plan backfires. Also: Dora, Alexa and Russell become suspicious of their new pastor and Schmidt learns the truth about Ashlee.” Is the truth about Ashlee that she was actually born “Ashley?” Everyone on this network is a frickin’ con artist. Code Black (CBS, 10 p.m.): It’s the “Second Year” over at Code Black, and based on all those cast “departures” that won’t ever be addressed, it also technically counts as a reboot. Even bigger evidence of that, however, is that Rob Lowe has joined the cast. You know, the old Brothers & Sisters/Parks & Rec approach. Will he die/run off with Rashida Jones here? Only time will tell. “Rob Lowe joins the series as Colonel Ethan Willis who comes on board at the hospital to teach the staff new techniques and technologies used on the combat field.” Just a reminder: This is a medical show, not a military show. And yes, Rob Lowe is going from the delightful and underrated The Grinder to the type of show The Grinder would have been all over in a hypothetical second season. Basically, The Grinder died for Code Black’s sins. Yep. That’s what we’re saying. Also, there are “shark bite victims” in this episode of television. The Grinder continues to rest. Botched Post Op (E!, 10 p.m.): Surely at least one of you wanted to know that Botched Post Op is ending its second season tonight. You’re welcome, rando. Gomorrah (SundanceTV, 10 p.m.): Italian crime series Gomorrah ends its first season tonight with the two hour finale, “100 Ways To Kill.” Please pull a Chris Jericho and list all 100 ways to kill, please pull a Chris Jericho and list all 100 ways to kill… In the episode, “all clans opposing or holding grudges against the Savastanos rally around Conte, forcing Genny to cut all ties. Imma’s intervention prevents an all-out war and reestablishes a fragile order.” Sounds super chill. Full Frontal With Samantha Bee (TBS, 10:30 p.m.): The apathetic terror of this election season continues (because while it’s totally justified to be afraid of the election result, can’t we all admit this entire campaign is frustrating and insane, no matter who your preferred candidate?) with a very special Full Frontal. We mean, it’s really this week’s episode, but it was pushed to tonight because of said election season. Here: “A special installment explores the first presidential debate of 2016.” This should be fun. It should also be a crushing remind of—again—how insant this entire campaign is, but it should be fun. WWE SummerSlam 2005, Hulk Hogan vs. Shawn Michaels: Legend vs. Icon (WWE Network/Dailymotion): This is in honor of Alasdair Wilkins, who may not be doing Tuesday What’s On Tonights anymore, but he at least deserves to be sent off in style. Also, now your friendly neighborhood What’s On Tonight contributor is the one who gets the last word instead of him, so it’s a win-win. Alasdair may think he’s the victim in a one-on-one WrestleMania match against The Undertaker here, but come on now. He’s actually the victim to Hulk Hogan’s shovel. At SummerSlam. Yes, in this instance—and this instance alone—Alasdair Wilkins is the Shawn Michaels to LaToya Ferguson’s… Hulk Hogan. It appears What’s On Tonight has finally worked itself into a shoot. And to everyone else who’s not a part of this weird TV Club farewell (so, everyone else), you should watch this match just to see the brilliant overselling from the incomparable Shawn Michaels when it comes to everything 52-year-old Hulk Hogan does.